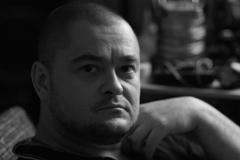 The Ukrainian Russian-speaking writer and poet Vladimir Rafeenko was born in 1969 in Donetsk. He studied Russian and culturology at Donetsk University, and subsequently worked as an editor at BAO and Cassiopeia. His articles have been published in newspapers since 1992, and »Tri dnja sredi nedeli« (tr. Three days in the middle of the week), the first of three volumes of poetry published to date, appeared in 1998. Although Rafeenko’s subsequent prose works are shaped by a more concise narrative style, he never quite relinquishes his trenchant brevity. »Newoswratnye glagoly« (2009; tr. Non-reflexive verbs) is an episodic novel about a timid philologist, whom two young and beautiful women fall in love with. The life of the protagonist, who lives in the little town of Tokorodsawa – not a typically Ukrainian name – meanders along in a sunny, technicolor world populated by strange and exotic creatures. However, all of this is overshadowed by rigid social rules: He is expected to do his military service, marry, or at least to become a hardened alcoholic, like the majority of his compatriots. A real intellectual at heart, he agonizes over life’s big questions, imagines, for instance, that even on Judgement Day, he will be interrogated pedantically by Christ: »When everyone foresook me, where were you when I needed you? Where you writing your doctoral thesis on non-reflexive verbs instead?« The protagonists in Rafeenko’s »Moskowski divertisment« (2011; tr. Moscow divertimento), »iliadic« novel initially serialized in a literary magazine, are named after characters from Homer’s epic poem, Russian fairy tales and E.T.A. Hoffmann’s »Nutcracker«. Here Moscow is the new Troy, besieged by a horde of rats, and only Achilles, who in Rafeenko’s tale is not the enemy but the savior of Troy, can rescue it from imminent danger. Rafeenko has written and published popular scientific and self-help books as well as crime novels. His socio-philosophical science-fiction novel »Demon Dekarta« (tr. Descartes‘ demon) won the Russian literary prize Russkaja Premija in 2013. Rafeenko lived in Donetsk until the beginning of the Ukraine conflict; he moved to Kiev in 2014, following the occupation of his native city by pro-Russian militia.